I'm not much of a traveler, I'm most comfortable at home and happy and content in my sewing room at home. But once a year this homebody breaks out of her comfort zone to take a mother/daughter vacation. This year we traveled to Italy, a first for both us, and I am so glad we did. 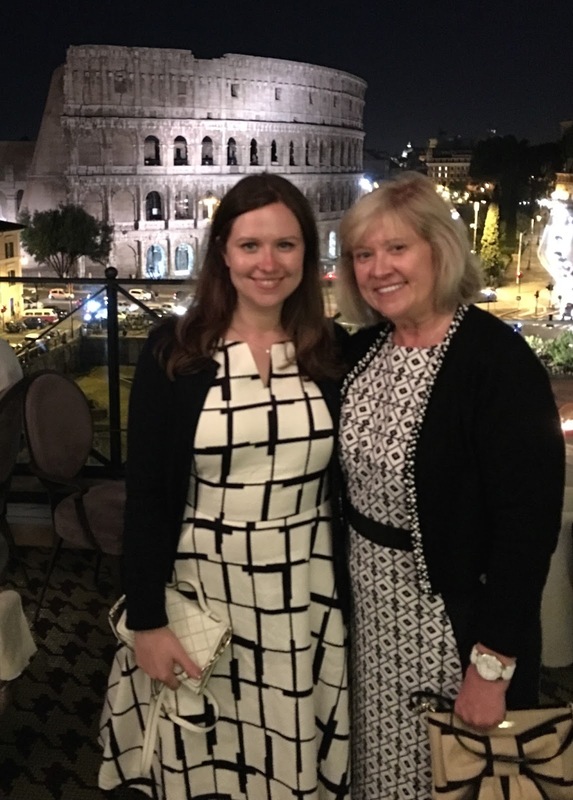 I met my daughter in Chicago where we flew to our first stop, Rome. We stayed at the Portrait Roma. A small boutique hotel with only 14 rooms. It was a great choice, the staff was very attentive and friendly, our room amazing, and the location perfect. 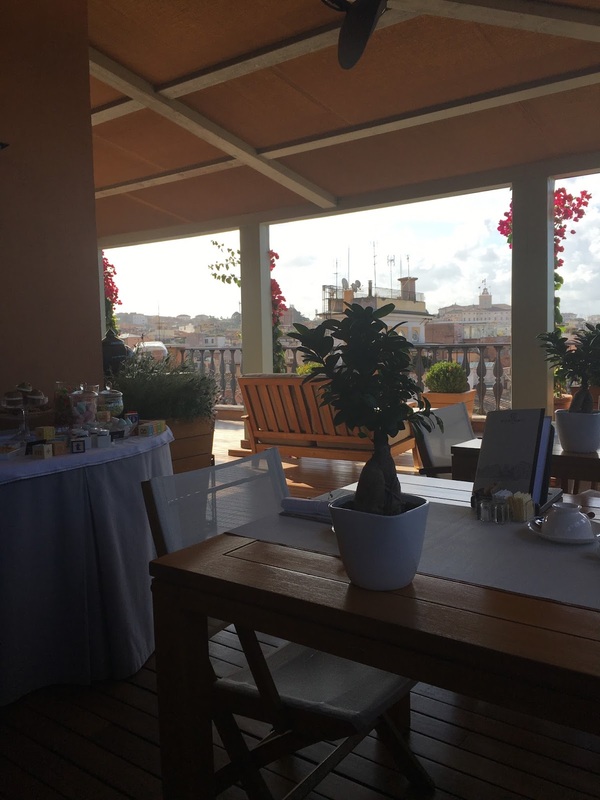 We started each day with breakfast on the rooftop terrace. It was a wonderful way to start our day. I highly recommend the Portrait Roma. So we landed in Rome around 9:30 am, checked into the hotel, unpacked, then traveled to the Ancient City for a tour. All of our tours were English speaking tours, our first guide did speak English, but he was from Scotland, so he had a bit of an accent. We could understand him but it was a little strange walking through the ruins of The Roman Forum with someone with a Scottish accent. After walking the ruins and Palatine Hill we toured the Colosseum. The tour company we used for these tours was Italy With Us. 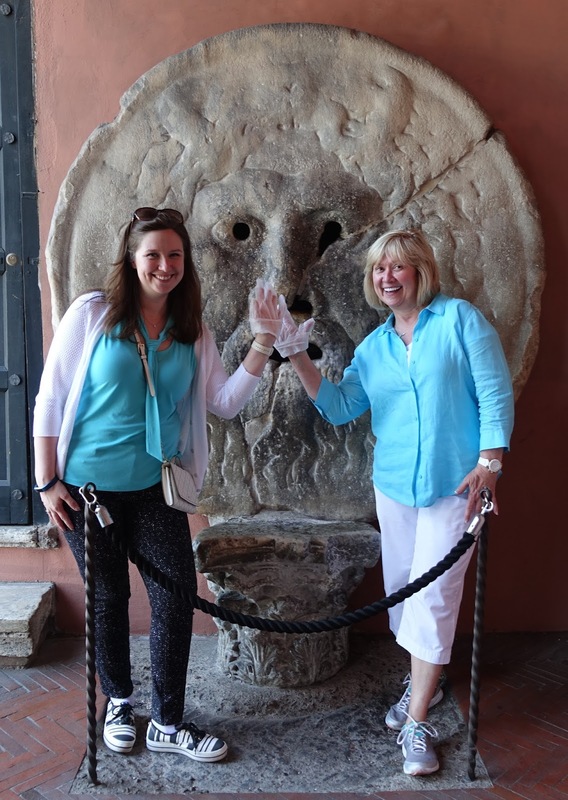 We signed up for a private tour, which was how the first half of the tour was conducted, we were then combined with a larger group for the Colosseum tour which was disappointing, the bigger the groups the slower the pace. Plus instead of directly communication with a guide you wear headsets, less personal. But we enjoyed all the sights just the same. We wrapped up our afternoon walking tour at 4:30 then hustled to the Piazza Navona for a 5 pm food tour. We intentionally picked two walking tours for our first day to see the sights while keeping moving, we were tired at the end of our first day but slept well and were on Rome time the next morning, which was a 7 hour difference for me and a 9 hour difference for my daughter. There are several food tours in Rome and we selected Secret Food Tour of Rome, it was a great choice and I recommend it. We drank our first cappuccino, ate our first Roman pizza, two different types of pasta, suppli, porchetta, a sampling of cheese and salami, and gelato for dessert. Our guide did a great job. I recommend it. If you're ever in a city for a limited time, a good food tour will give you the opportunity to try a variety of local food in a short period of time plus you walk from restaurant to restaurant, which gives you a good feel for where you are in a new city. After our terrace breakfast on day two in Rome, our guide Katie Farrar, from Eyes of Rome, met us for a walking tour around the city. The Trevi fountain surpassed my expectations, it was huge and the detail in the sculptures breathtaking. We made a point to walk by the fountain several times when we were out and about, I could not get enough of it. There are ruins and churches tucked around every corner and in each available space. Are you familiar with the Mouth of Truth? If you're a fan of the movie Roman Holiday with Audrey Hepburn then this ancient carving will be familiar to you. The history of the Mouth of Truth is up for debate, some think it's a manhole cover, lol. But legend has it that if you stick your hand in the mouth then tell a lie, you'll lose your hand. I still wanted to wait in line to stick my hand in the mouth just like Audrey Hepburn, even if it was an ancient manhole cover. However, anyone who knows me knows I'm a germ nut, I wasn't going to stick my hand in the mouth of anything that old, especially after people from all over the world were sticking their hands in that mouth, so I brought us gloves, which our guide said was a first for her. 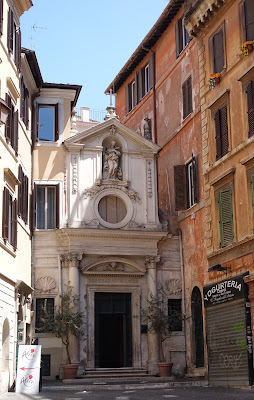 Our morning walking tour included the Pantheon, Piazza Navona, Spanish Steps and several other stops. 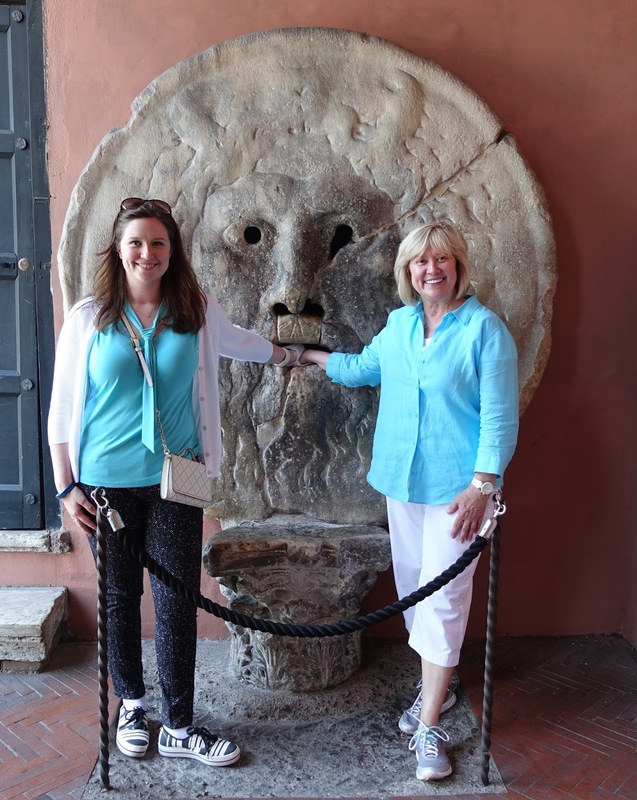 We loved our guide and highly recommend Katie and Eyes of Rome. After our morning walking tour we ate lunch at Colline Emiliane, a small family run restaurant. I ordered eggplant lasagna and it was amazing, although the homemade pasta was so delicious I think I would have enjoyed it with anything in between those layers of noodles. I recommend it. We wanted to see more of the city but were tired of walking so we went on a golf cart tour in the afternoon. One of our stops was the Secret Keyhole. I"ll not spoil the surprise of what you see when you look through the keyhole. The golf cart tour was offered by our hotel, it was fun and a good use of our time. For dinner on day two we ate at Aroma. The food was amazing as was the view, I recommend it. Day three in Rome started with a tour of the Vatican. We booked the early bird tour through Eyes of Rome and were thrilled to have Katie again as our guide. Katie is an American who speaks fluent Italian, the perfect combo for us. 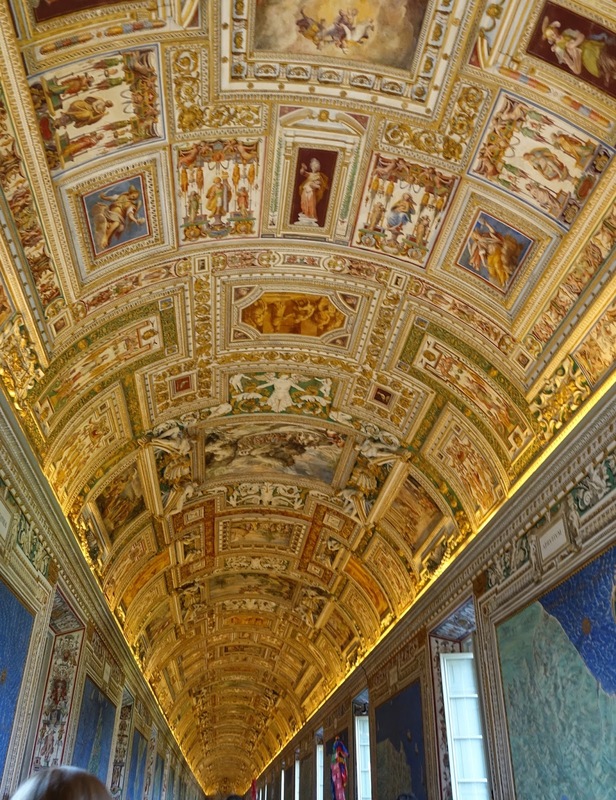 The Vatican was amazing. The sheer space of the compound took me by surprise. All the halls are elaborately painted. The buildings we visited were packed with art and there is more that is not on display in basements. It's hard to comprehend the size of St. Peter's Basilica, even when you're standing in the middle of it. I was expecting big, but it was football stadium size big. No wonder it took over a 100 years to build. We were not allowed to take pictures of the Sistine Chapel, but it was as amazing as I expected, but again, bigger than I expected. 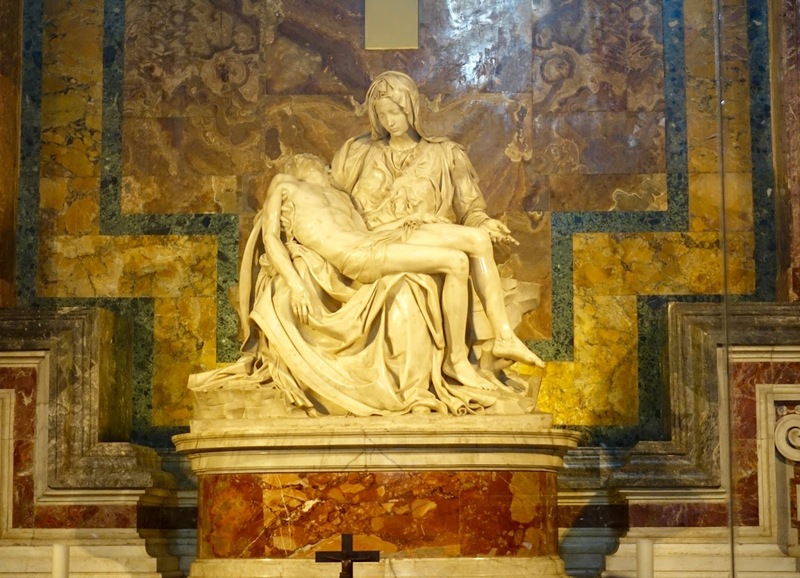 The Pieta by Michael Angelo was my favorite pice of art. 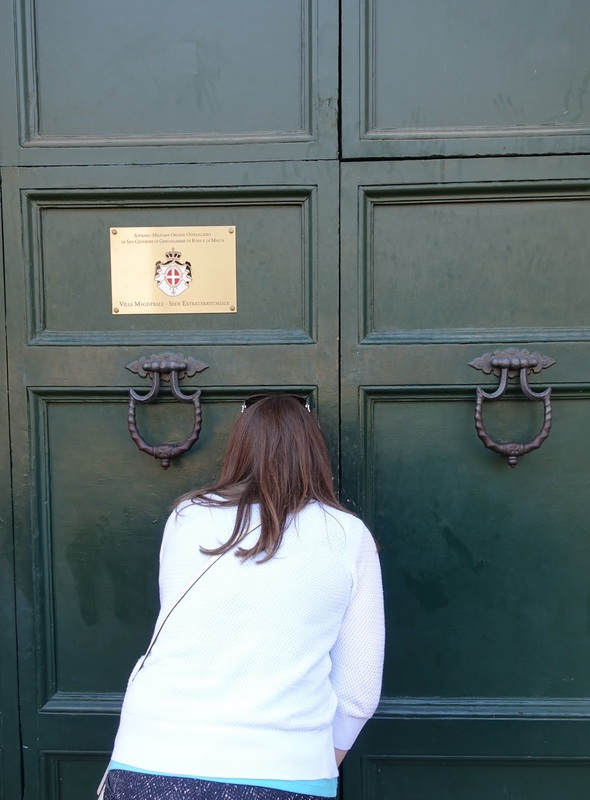 Our Vatican tour lasted 4 hours, we were in awe the entire time. For lunch we ate at Dilla, the food was wonderful and I recommend it. We spent our afternoon checking out the shops near the Spanish Steps. For dinner we ate at Casa Coppelle, another great meal, I recommend it. This was the end of our time in Rome, the next morning we boarded a train to Florence, I'll blog about that leg of the trip later this week. We loved Rome and wished we had more time in the city, I'll go back for sure, the sooner the better. Thanks for all the info. I have never been but now I want to go. What a wonderful tour you've given us. I would love to go there some day. Thanks so much for sharing your photos and for you honest commentary about your trip to Rome. I think you could write travel articles! Anyhow, I'm glad you enjoyed yourself, and welcome back to your happy home and snug sewing room. It sure sounds like a wonderful time in Rome and looks like you enjoyed the best of sights. Never enough time to see it all and wish we all could take a month trip to live in different countries. Can't wait for your next leg of your trip and thanks so much for sharing Thelma. It looks like you've had a wonderful time! I have a friend who was in the same city as the same time (just about) as you. He was in Milan yesterday and today is on his way to France. Well, thank you for all of this! 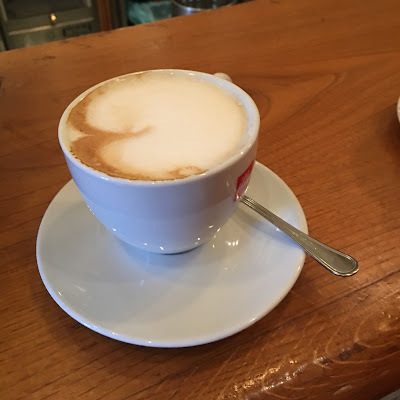 Am leaving for Rome tomorrow morning, a first for me, so this is a great post! I am half French, half Italian and I am so glad to learn how much you enjoyed your trip to Rome. My italian family came from Florence and I wish your visit to Florence as amazing as your tour of Rome. You made me smile with your gloves to enter the Mouth of Truth, I did the same. I am a germ nut too ! Oh, this was a nice surprise to see!! I especially love the pics of you and your daughter. Thanks for sharing!